Four weeks ago I was able to put wheels down in a new nation and make Japan the 15th country I’ve ridden a bicycle in. A small side note: even though this post is mostly about Tokyo I actually began the ride in Kyoto after I found myself there (thanks to the beautiful, why-don’t-we-have-these-in-the-U.S.? Shinkansen - the bullet train) with a few hours free - plenty of time to take the Bike Friday out of the case, set it up, and hit the road. And the rule of The Only applies to the cyclists you run into as well. In the U.S. you might find a random woman with a child on the back of her bike, but in Kyoto (and later, Tokyo) you’d often see two or three in a row - often carrying two kids. There’s just something truly welcoming about a cycling culture that has such a wonderful mix of people and equipment riding around. Bike equivalents of minivans and sports cars were everywhere. And I also noticed another truism: the more a business loves cyclists, the more cyclists love that business back. A lot of places had tiny parking lots just for bicycles right in front. Another one I adored was at the Kyoto Zoo - spotted after closing hours. Made me think how much I want parking minimums for cars to go away in the U.S. While I was marveling at the bike parking lots I realized nearly all of Japan’s cyclists had something I didn’t: a kickstand. Yes, the much mocked appendage of the American cycling world was actually in high demand in Japan. Most of the time I wanted to shop somewhere, I’d flip the bike over like I was changing a tire and lock it to itself. This may look odd to my U.S. cycling friends. But that is how it is done as bike theft is apparently rare. To show you how rare here is a photo of a lock display at a bike shop. Unlike shops such as, for instance, NYCeWheels in Manhattan, you don't need a spotter to get any of these off the shelf. I also love checking out the different cycling signage when I visit a new country. For instance, I just loved the sharrow symbol in Kyoto. The bicycle has a basket! I even said it out loud as I was biking by. They actually want and expect cyclists to ride around the city and participate in commerce! Japan: I want that stencil. One thing I had to do was buy a bike bell since I read somewhere that all bikes in Tokyo require one. I didn’t want to spend a lot of money and in a bargain bin at a R’s Cycle bike shop, Japan delivered as only Japan can. I was only in Kyoto for about a day and a half. Far too little time to spend in a city where they shot the bamboo grove scene in Crouching Tiger, Hidden Dragon. The lovely ride in Kyoto was good practice before I unpacked the bike again in Tokyo. It was also going to be very humid and raining every day (or parts of every day) during my time in Tokyo and I was glad I didn’t have to get used to riding on the left before I checked in to the beautiful Keio Plaza Hotel to unpack my bike once again. Three days I pushed the bike in and out of the hotel and only got smiles from the staff - the way it should be. In addition to having a Hello Kitty room (that I did not stay in) they also have a fantastic convenience store on the ground floor and in-room coffee. 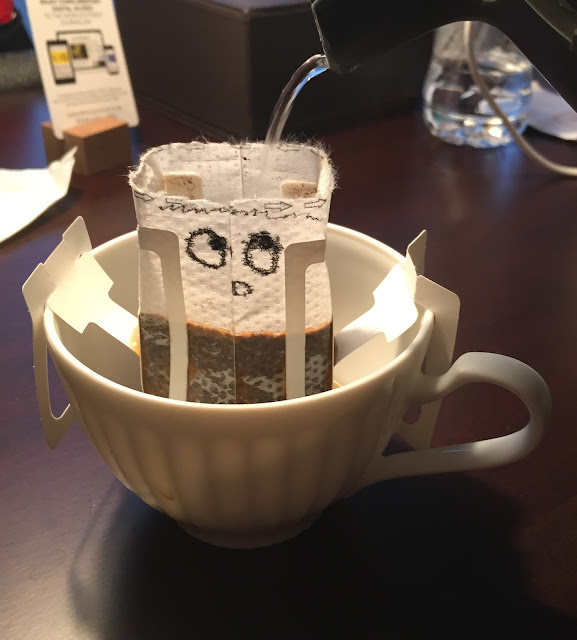 This style coffee maker - which I had never seen before - is actually very common in Japan: tear open the pouch, pull apart the little paper arms, rip the perforation, set it on the cup and pour hot water in. This is the coffee from Kieo Plaza Hotel. The artwork is mine. But I’m getting off the subject. Tokyo is not like Kyoto. It’s yet another city on this planet that is choking itself to death with cars and isn’t realizing it. The traffic lives up to the legend. I don’t know if the rain or the added stress of riding on the left was affecting me but I found Tokyo to be a confounding city. Roads twist, turn and go under and around each other. And when it appears a road is closed to bikes the shared sidewalk doesn’t always follow the same route the cars go. Even though I had one of those pocket wi-fi things that you rent at the airport that gave my iPhone access to maps, I still managed to get lost several times. Obviously, it is a lot narrower than the one in Kyoto but my other beef was that if the stencil was any further than the left it would be on the sidewalk. And that, as it turned out, was directly related to the other different thing about Tokyo compared to most other places I’ve ridden: the shared sidewalk culture: bikes are invited and encouraged to ride…there. My first day was riding aimlessly around Tokyo to figure out how the city breathed. It reminded me a lot like New York but it was a lot harder because of the whole ‘riding on the left’ bit. Years ago, in London, I found that when making a turn on a bike share bike I’d absently drift over to the right side of the road only to be in the path of a Reliant Robin or something. So I made it a habit of always bringing my own helmet with me when traveling and moving my helmet mounted rearview mirror from my left side to my right as a visual cue to pedal on the left. Still, my American brain, shaped by pedaling on the right for decades, would instinctively look for dangers that weren’t there and I had to second-guess every ordinary move I’d make (like looking over to where a nearby motorist would be but seeing an empty seat, a baby or small dog because all cars are right-hand drive) It was like patting your stomach, rubbing your head, and doing your taxes while reciting the Greek alphabet. But still a lot of fun - especially when I’d notice people who looked like they were commuting to work or going to on a formal dinner date. Yes, America: you can ride in your normal clothes and shoes. I soon discovered that like many other cities I’ve ridden in: the faster you ride, the less stressful it is. I did end up having to visit another bike shop for a rather peculiar reason: thanks to the wind noise the little pink, smiley propeller made on my new bike bell I bought in Kyoto, I missed the rattling sound that came from the Bike Friday’s stem in Tokyo: the nut that held it in place fell off and was lost forever. I found Flame Bike - a helpful little shop - and replaced the missing nut. I decided to get out of the city on my last day. Drenched by the rain biking through the traffic-choked streets of downtown Tokyo (and not willing to join the masses that ride bicycles while holding an umbrella) I decided to pedal west towards Tama Lake - hopefully along a bike path I read about on TokyoByBike.com. But before I made it that far, I was already thankful for choosing to leave the middle of Tokyo: with fewer cars on the roads and not as many stoplights, I was able to open up the throttle. In keeping with Biking Nations tradition, I didn’t have a plan for lunch. Lucky for me I didn’t have to subsist on popsicles like I did when riding in Delhi and Gurgaon because I found a noodle place. Signage featuring pigs on a tandem (w/ the last stoker eating noodles) got my attention. Inside, I waited for my order and drank water while Meghan Trainor’s No and other fine U.S. exports played on the restaurant sound system. Thanks to the wi-fi device, I went over the map on my phone: just 7.1 km to go to get to the lake. And I was going to get properly fueled. As usual: when you don’t speak the language you can rely on the international language of money and pointing, and that language didn’t fail me. I ate well. I also drank well: even though I had a Camelback I discovered, completely by accident, Pocari Sweat which is a well known sports drink there. At one of the numerous vending machines all over Tokyo, I put in some Yen and chose what I thought was water but it was a product called Pocari Sweat. Discovering it was good, I ended up buying a bottle almost every time I stopped. Pocari Sweat: Bought By Accident. Awesome on Purpose (Fly me back there and I’ll film a commercial like Bill Murray did in Lost in Translation). My satisfaction at the restaurant wasn’t even dented when I discovered the rear tire of the Bike Friday had gone flat. I found shady spot nearby and changed it out (while humming No) before pressing on - and reasoning I should replace the aging tire before my next trip. Completely by accident, I ended up finding the bike path. This is a beautiful path and, as advertised, it led me to Tama Lake. I don’t know very much about it but the silence of being there was the perfect counter to the noise of downtown Tokyo I had experienced the day before. After resting, taking photos and just enjoying the moment I left Tama Lake and followed the bike path to Rt. 5, which I followed most of the way back. I stopped at a bike shop I neglected to photograph to check it out and buy a tube and noticed a lot of clouds coming in. My streak of riding in the rain was about to come to an end - but I was still having more fun and moving faster than these people. Pretty soon I heard something I hadn’t heard in well over a year: thunder. Cyclists on both the sidewalk and the road began to ride a lot faster, and I did the same. 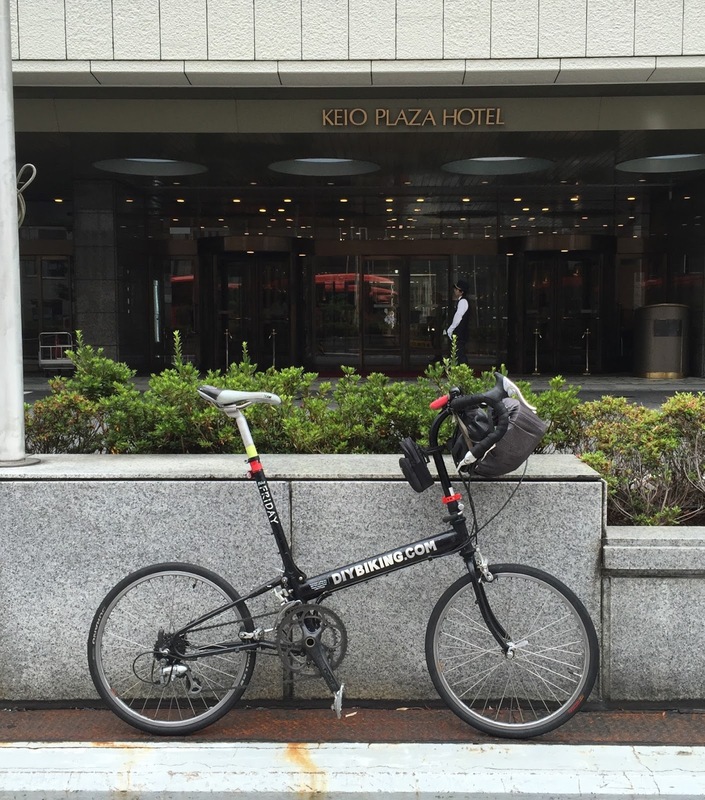 I did get a few sprinkles on me but managed to get back to the Keio Plaza Hotel around 3:00pm with about 41 miles on the odometer. Minutes after I got the bike to my room, the sky opened up (the rain was so bad it caused local flooding that made the evening news)…and my rear tire had gone flat once again. Since I wasn’t planning to ride the next day anyway and the tires have to be deflated before going on the plane I decided not to fix it until I returned to San Jose. The next day I got to visit the Mori Art Museum and head up to the top floor so I could have a good look at the city I had spent a few days biking in. It wasn’t until I looked almost straight down that I realized what was amiss: there was a lot of car traffic - a lot. And try as it might Tokyo can’t clever its way out of it - it actually needs to change the infrastructure to give more to cyclists and less to motorists. This philosophy isn’t just flawed, its deadly. 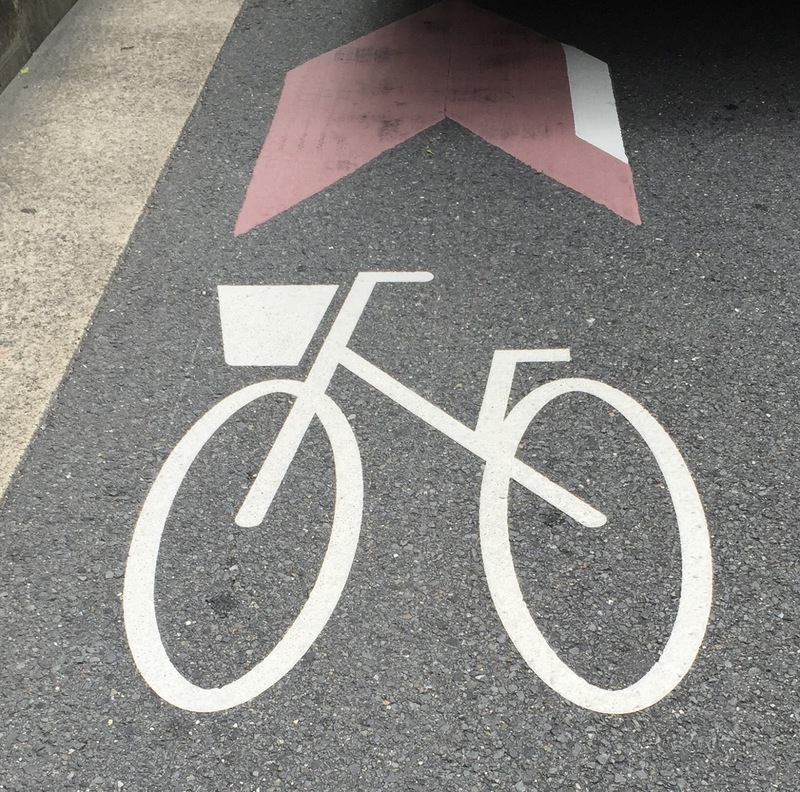 More cyclists die per capita in Japan than in the U.S. So if there are any urban planners in Japan who are reading this: your high-speed trains are beautiful enough to make me weep. Your space shuttle-complicated toilets are sublime. And your umbrella management systems are thrilling. So I’m sure you can handle road diets and just use your collective brilliance to redesign your streets in such a way that people will use their cars less, use their bikes more, and get more people to where they want to go faster and alive. Thanks for everything, Kyoto and Tokyo (especially the little pancake sandwiches sold in convenience stores that have butter and syrup in the middle. Nitrous oxide for my legs, they are). And to all: thanks for reading and thanks for riding. * That actually happened on the ride back from Tama Lake. 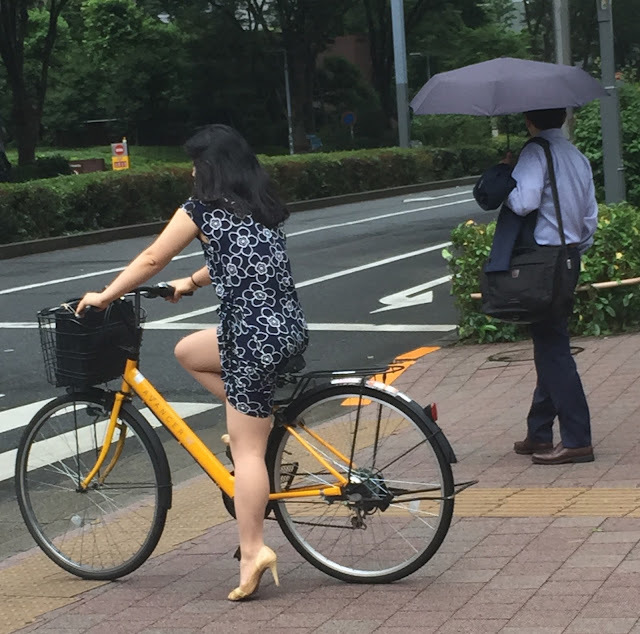 A wonderful summary of what its like to cycle in Japanese cities that should serve as a valuable guide for others considering doing the same. But I'm also glad you managed to escape to Tamako for a look at the less built up areas of Tokyo, its a lovely half day ride that anyone can do. Thanks for posting! I'm headed to Kyoto in a month or so and thinking of bringing my own bike with me.